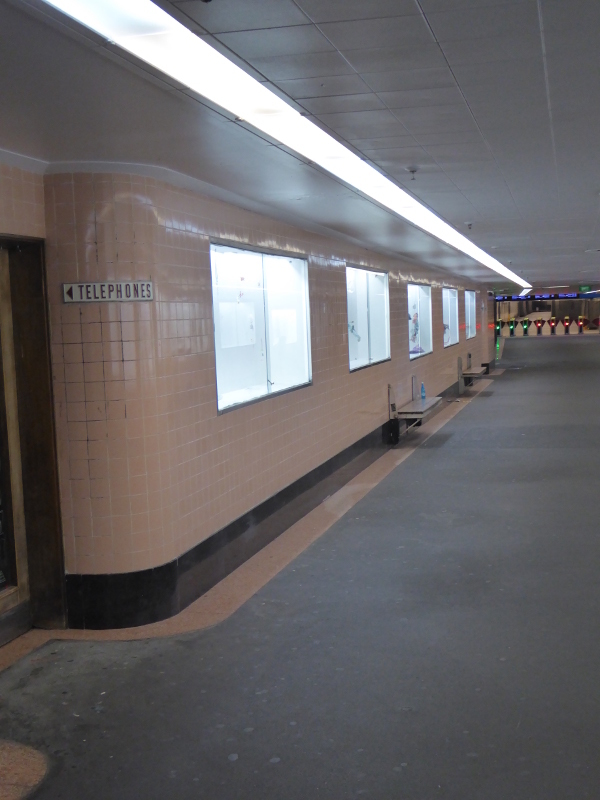 1950s vintage arcade built to ease pedestrian traffic into Flinders St station for the Melbourne Olympics. Check it out while you can as Metro Tunnel building works might see it pulled apart. 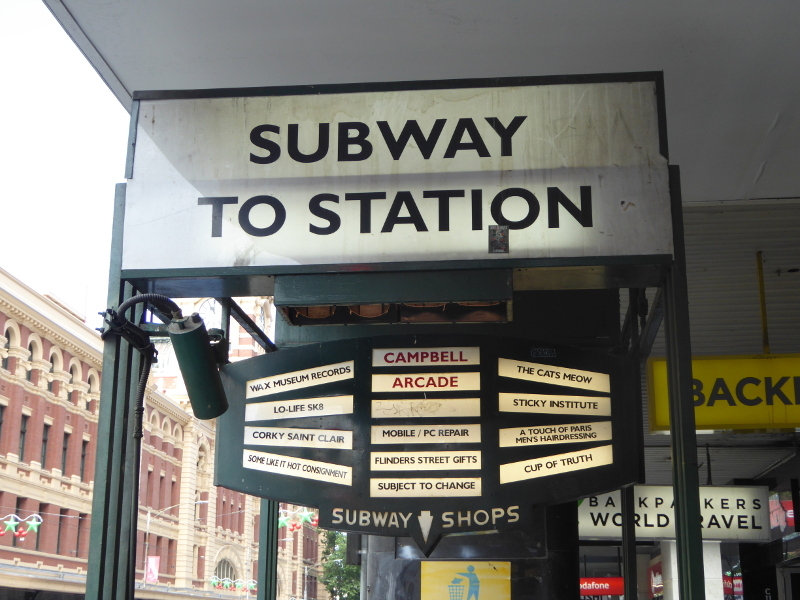 Campbell Arcade near Flinders Street station is a wonderful slice of 1950s vintage Victoria, but you’d better get in there quick if you want to see it, because tunnel building for the Melbourne Metro is due to destroy a good part of this arcade in 2019. I’ll come back to that public transport project later, but first let’s talk about the good stuff that was still to be seen at the time of my visit in November 2018. 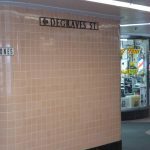 The pale pink tiling is very 1950s, and is probably pretty well unchanged from the early years of this arcade in 1955, as are the thick black marble pillars that line the corridor of the shopping part of the arcade. I don’t think any of the businesses still in the arcade today were among the original occupants when the arcade opened just before the Melbourne Olympics, but A Touch of Paris is probably the longest surviving tenant. It’s actually a men’s barbers, in spite of its name which might conjure up more glamorous looks for the ladies. Sadly, this is one of the two shops sure to disappear in the upcoming tunnel developments, so I must get back for a haircut and chat to the owners before they have to close (PS – I did go back and had Michelle cut my hair just before Christmas). I was there at about 11am on a Monday morning, too early for many of the shops in Campbell Arcade. But the barbers were open, along with the coffee shop A Cup of Truth, the computer repair shop (well they certainly weren’t there in 1955), and one of the vintage clothes shops. It’s a pretty quiet arcade in terms of footfall, and judging by some of the stories I found on Trove, the arcade has had that problem since its inception (see below under History). I have to confess to never having heard of ‘zines’ until I found The Sticky Institute in Campbell Arcade. I thought it was something mathematical at first, to go along with cosines, a third term I can’t for the life of me remember from schoolday maths lessons. But no, I think the pronunciation is ‘zeens’ as it’s an abbreviation for ‘magazine’, and The Sticky Institute is the kind of place that promotes independent, small-scale arty magazines and comics, which again seem to have a cult following. But in my three or four visits to the Arcade, their shop has never been open (after midday on certain days, I think). There are also the Dirty Dozen art spaces, with artists displaying in all the window panels between the pink tiling, where there are no shops. Presumably this little collective of artists will also have to find somewhere else to show their work once the drilling begins in 2019. 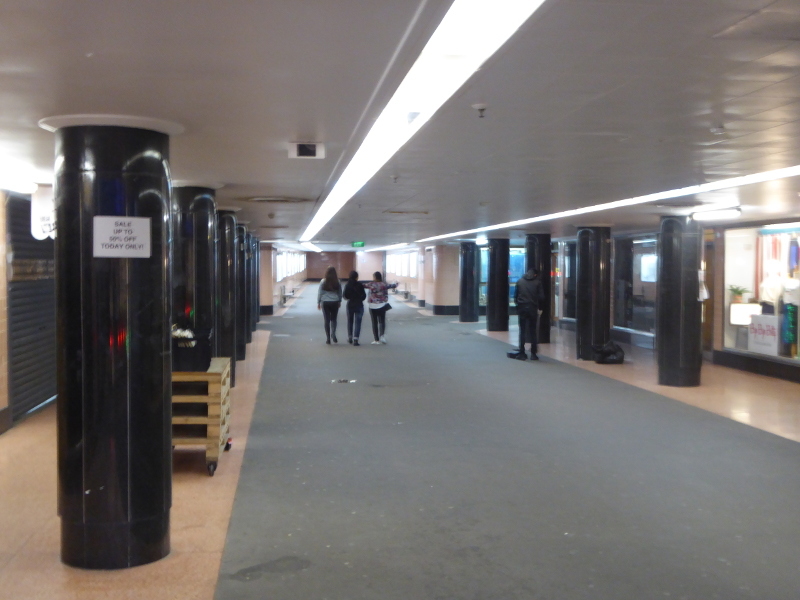 And then there is a curved dead-end to the corridor which runs all the way from the Flinders Street ticket gates. 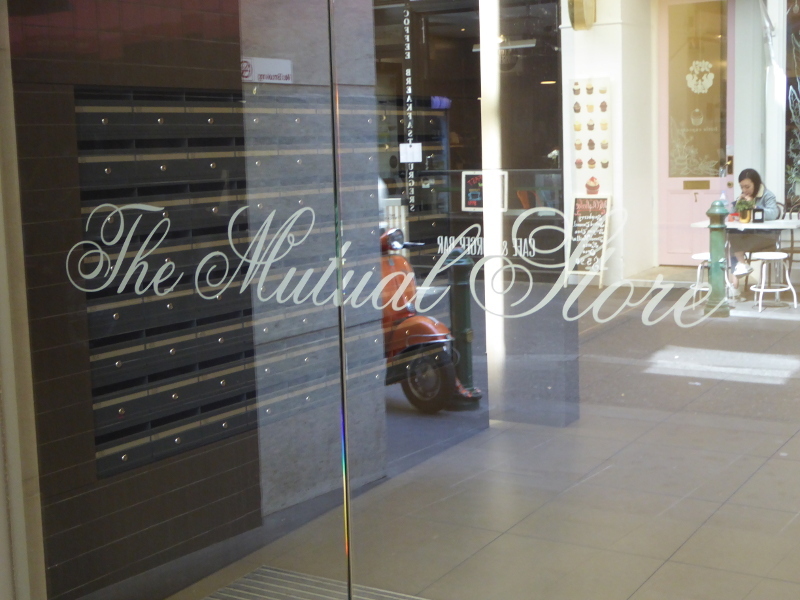 At first I wondered where it used to lead, but then up on ground level, I found the door into what was the Mutual Store, and remembered from my Trove search before coming to the arcade, that one of the main purposes of the Campbell Arcade was to provide direct access from below ground to what was then a bit of a Melbourne shopping icon. 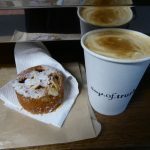 Coffee in Campbell Arcade was a real treat, and the guy who runs it filled me in on what he knows of the plans for the arcade. Basically, leases run out in July 2019, after which his future is far from certain. The building work may take up to three years, another customer there reckoned, and although he may be offered a lease when the arcade is once again open to the public, what do you do with a business that has to suspend its trading for three years? He pointed out where the mega drills will push through from the arcade ceiling straight through A Touch of Paris barbers, taking out also the shop next door, and with all the dust and barriers in place during the works, he can’t see how any of the businesses would continue to operate after July next year. Campbell Arcade is apparently heritage listed now, but that does not look like saving the place, with works of this scale cutting right through it. I’m guessing the heritage listing will mean some bits of the arcade will be preserved, and I believe the National Trust are calling for a bigger section than planned to still be accessible to the passing public without needing to be inside Flinders Street station. I’m a big supporter of public transport, and I’m sure the Metro Tunnel will be a positive addition to Melbourne’s transport network, but after the experience I had in NSW where the vintage Parramatta Olympic Pool was sacrificed for the building of a new sports stadium, in spite of suggestions that the pool and stadium could have lived side by side with some modifications to the developers’ plans, I am extremely sceptical of good outcomes when big building companies table their proposals and have government backing. In those circumstances, tweaking of plans to cater for annoying heritage-types rarely seems to happen. It could be argued also that part of the problem with Campbell Arcade right from the start was lack of footfall. So maybe it is a sacrifice that needs to be made in the name of public progress. I’m not sure. What are your thoughts? And in any case, readers, just make sure you get down there in the next six months or so if you want to see this rather distinctive piece of Vintage Victoria. 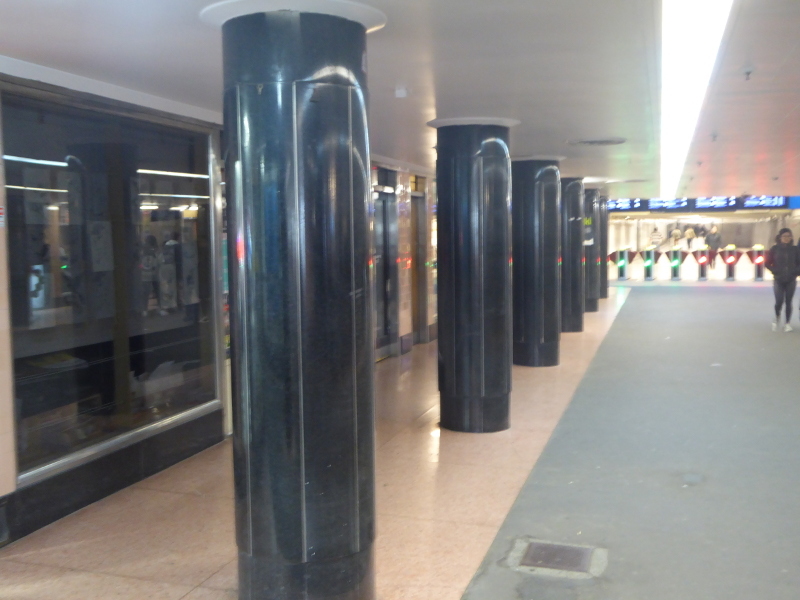 Access possible from Flinders St station or via the staircases on Flinders Street or on Degraves Street. No access possible now via the former Mutual Store building. A lot of the shops don’t open every day or don’t open till midday, but you can always hang out drinking coffee earlier. 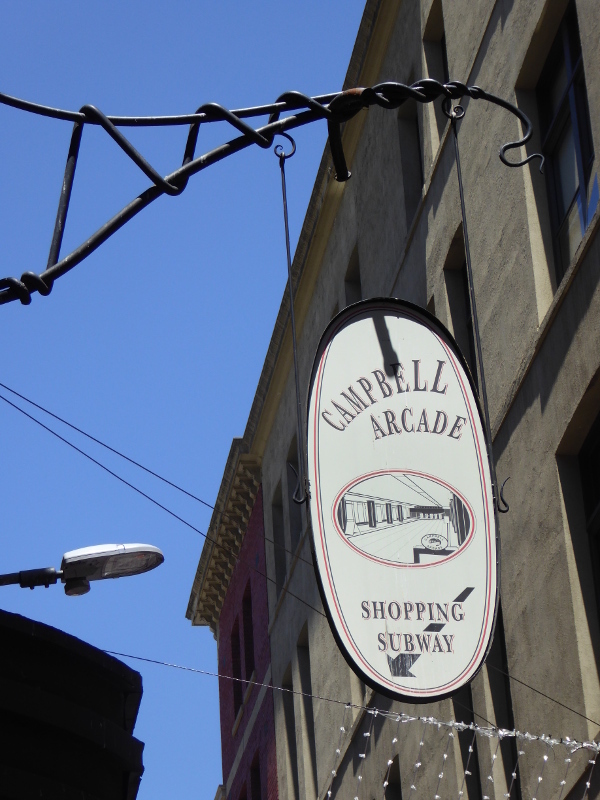 Campbell Arcade was named after the councillor who got the subway approved in 1952. 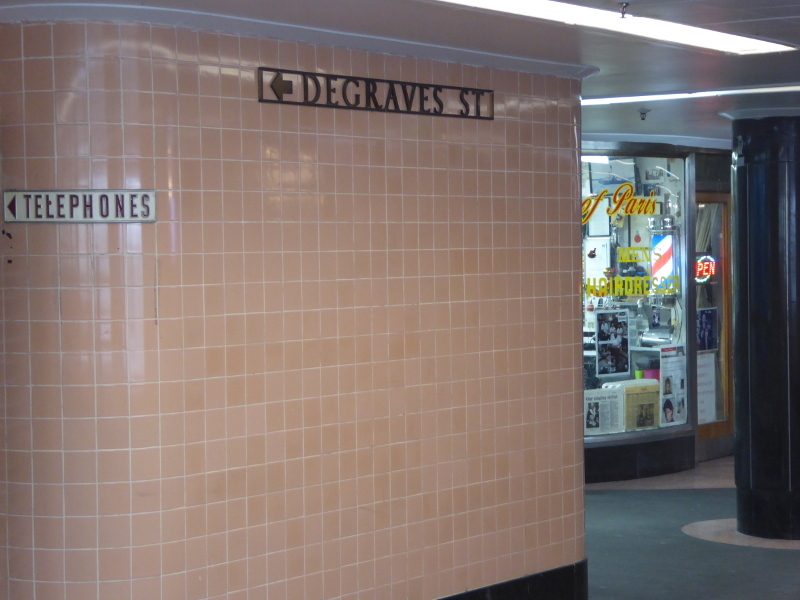 It continued to be known as Degraves Street subway, though, as the subway was open even before the shops in the arcade opened their doors for the first time. 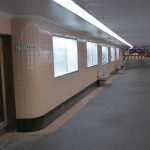 The arcade opened in September 1955, and was the first post WW2 infrastructure build in Melbourne. 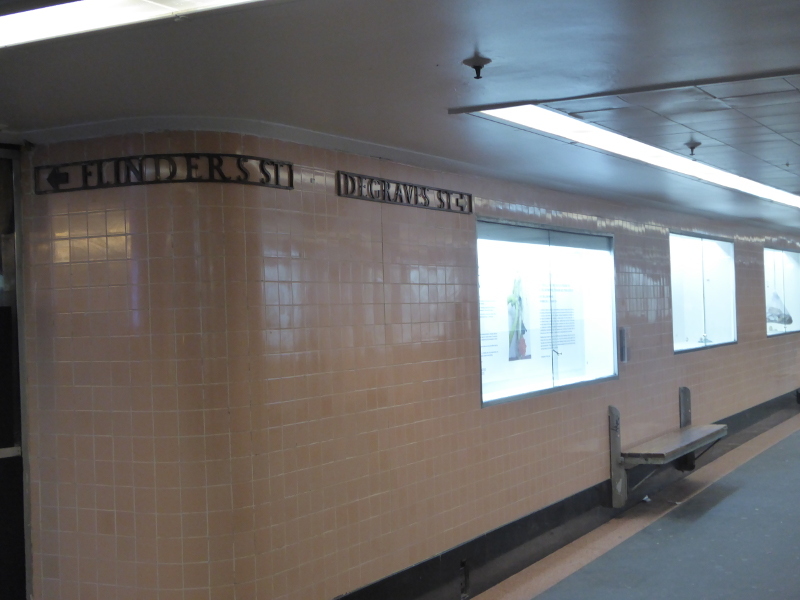 It was built with a view to easing pedestrian movements during the Melbourne Olympics of 1956. 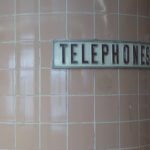 The first shops in Campbell Arcade were: men’s wear, dry cleaning, children’s wear or frocks, electrical goods, hosiery or handbags, cakes or pastry cooks, ladies wear, confectionery, jewellery or gifts, pre-packed meat or deli, newsagent, tobacconist. The noise from trams going past overhead apparently made it difficult for opening day speeches to be heard at Campbell Arcade. This was a problem which was to repeated over the following weeks and months, too…. 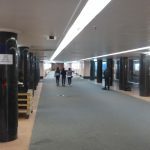 One correspondent to a Melbourne newspaper complained of the blaring loudspeaker making announcements which put him off taking the subway completely. 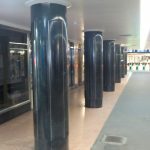 However, the builders clearly knew of this problem even before the arcade opened, as they commissioned the CSIRO to design a special soundproof lining to the tiling, and a suspended ceiling to reduce slightly the traffic noise from above. Estimates of 17,000 people a day had ended up being nearer 2,000 a day, though part of me couldn’t help thinking that the arcade had been built partly to cope with the Olympics, which were not until November 1956, so perhaps the shopkeepers were just being impatient? 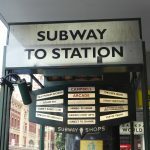 One article I read claimed that the building of The Loop on Melbourne’s city rail network largely took away much of the usefulness of Campbell Arcade, and people still seemed to prefer to wait to cross the road to the station rather than go down and then upstairs via the arcade, even if it was air conditioned in those days. 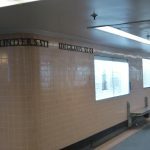 The Melbourne Curious blog has a fantastic post on the history of Flinders Street Station, with a mention down near the bottom for Campbell Arcade, or Degraves Street Subway. 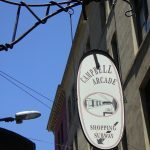 This 2012 piece on the Culture Victoria website highlights the use of Campbell Arcade for displaying art. 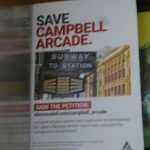 Farrago Magazine headlined on the threat of demolition of Campbell Arcade back in May 2018. 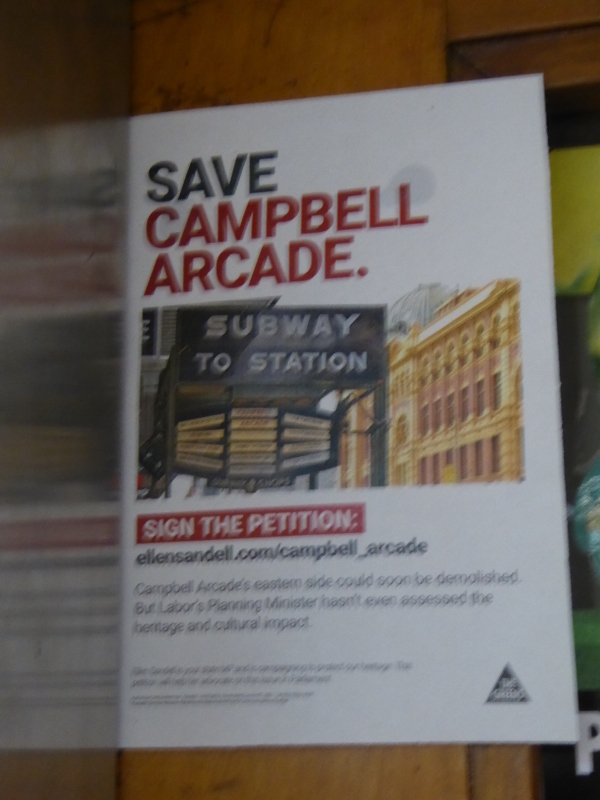 This Architecture Australia magazine piece from March 2018 also highlights the campaign to save Campbell Arcade. 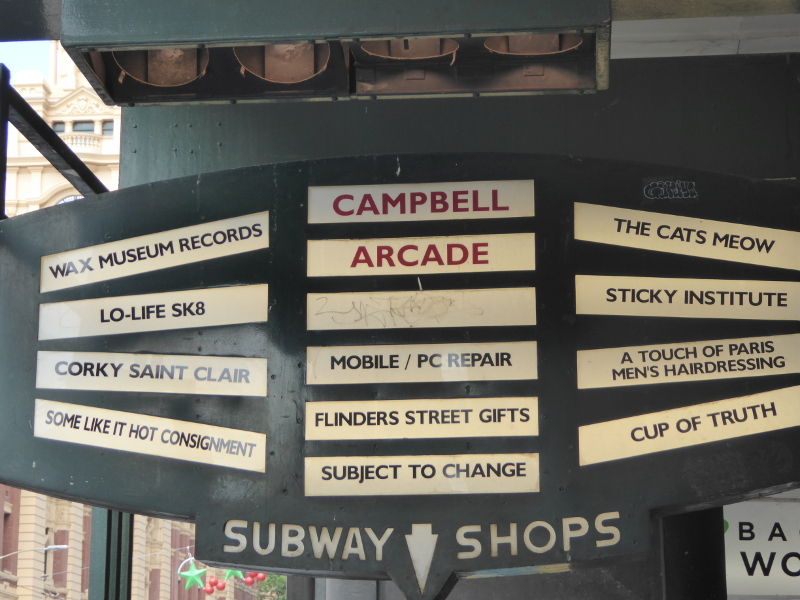 The Age newspaper has described Campbell Arcade as a refuge for ‘arty types and tourists’. And this piece from the Trust Advocate outlines the National Trust’s concerns about the development plan for the Metro Tunnel. 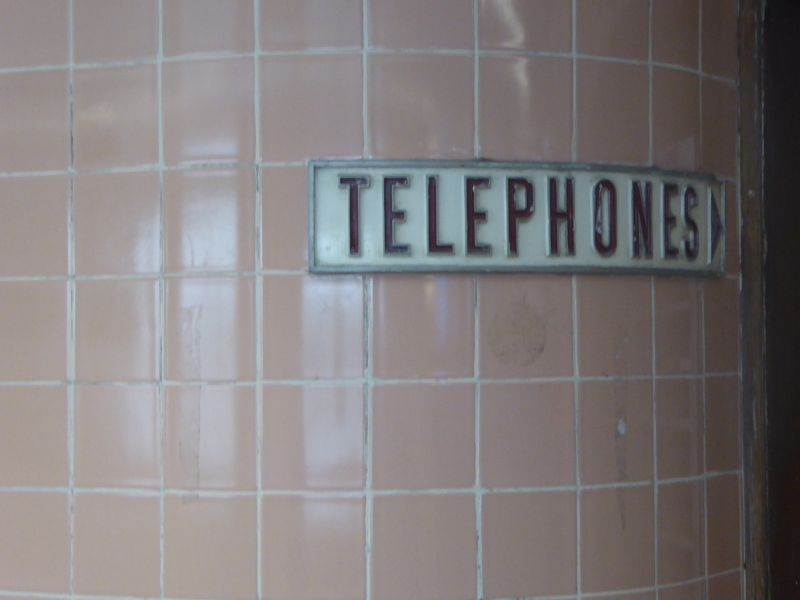 What are your stories and memories of the Campbell Arcade? Are you a regular at one of the shops in the arcade or do you grab a coffee in Campbell Arcade on your way through? Was there a shop you used to love which is no longer there? 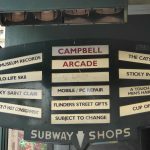 And does anybody have their own memories of Campbell Arcade or want to share a recent experience in the arcade? Comment below if you have anything to add, especially if you want to save this piece of 1950s Melbourne heritage. Excellent coffee here in this little hole-in-the-wall. 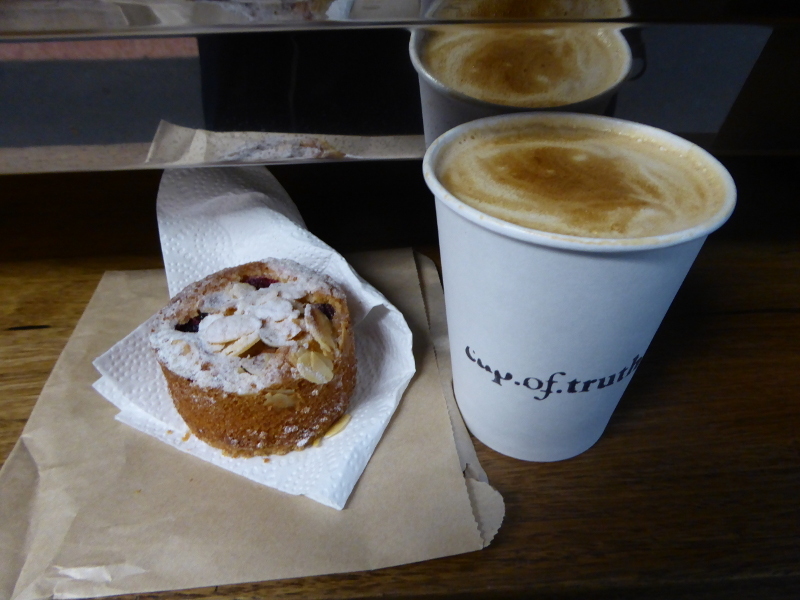 No seating but it’s not takeaway only, and you can have your coffee in a proper cup (always tastes better, I think). I went with the owner’s suggestion of the Bakewell Tart, which he said is THE best thing to get on a Monday morning: soft but not too soft, and fresh fruit in season. Delicious! Apparently there is a bowling alley at the Northern end of the arcade. The entrance is concealed by a makeshift wall.